When was the last time you truly felt listened to? Like, you could sense that the other person was so intently listening that you felt completely understood. They allowed for you to fully speak your mind without judgment, trying to get a word in, or fix your situation? But this is surprisingly easier said than done. The act of listening seems pretty simple but doing it well takes some effort. The key is to be fully present in the moment (the Now) but with our minds running at 100 mph and the amount of distractions around us, they tend to zap our ability to stay in the present and fully focus. Say, your partner is having trouble at work and it’s really bothering them. They come to you to vent but all you catch are snippets of their story because you are distracted by the TV playing in the background. Your partner can sense that you didn’t hear what was said (your body language is a dead give-away) and feels hurt. This leads to an argument because you where half-listening while they were sharing a pain-point. Or, you cut them off mid-story and start suggesting ideas to remedy the situation. They don't feel like they are being fully heard, which causes them to feel frustrated. Even with the best intentions, this leads to an argument because your partner just wants you to listen to them, not fix the situation (I am toooootally guilty of this! I am such a fixer). 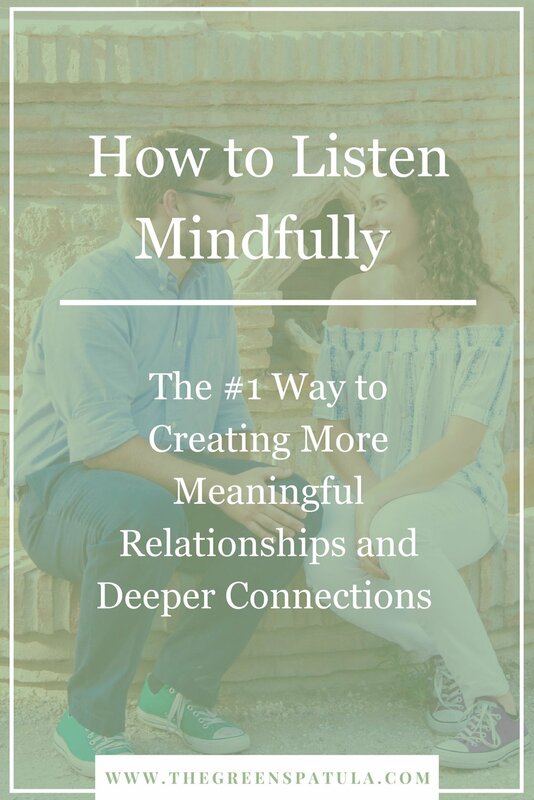 To avoid future situations like these, using the power of mindful listening will bring you back to the Now and help you create an open space for someone to talk. Be honest with them if you cannot focus right now. You are a better listener when you can divert all your attention on them. We are also so eager to voice our own opinion that we impatiently wait for the other person to finish their sentence just so we can speak. As a result, we miss the central message because we are too busy focusing on our own thoughts and response. When we drift off, we are no longer mindfully listening, which can lead to misunderstandings and miscommunications. BUT, practicing mindful listening is simple when you use the suggestions above. Just, remember to take a breath and let the other person do the work because in that moment all you have to do is listen.